G R E AT E R N A S H V I L L E H O U S E & H O M E & G A R D E N ™ 22 H ardwood flooring is au- thentic and a piece of nature in ones home. Combining the raw material with color and sheen creates a one-of-a-kind design suitable for expressing the personality of the homeowner, says An- drew Denny of Textures Nashville. Hardwood flooring provides a beautiful canvas for which the rest of the house is painted, Denny says. "Hard- wood flooring integrates na- ture and fashion to create a timeless design element in today's homes. 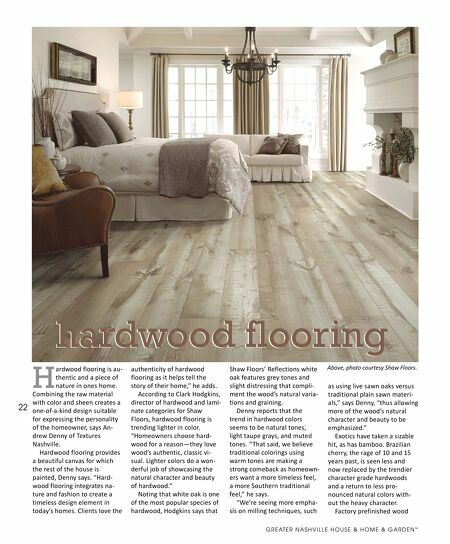 Clients love the authenticity of hardwood flooring as it helps tell the story of their home," he adds. According to Clark Hodgkins, director of hardwood and lami- nate categories for Shaw Floors, hardwood flooring is trending lighter in color. 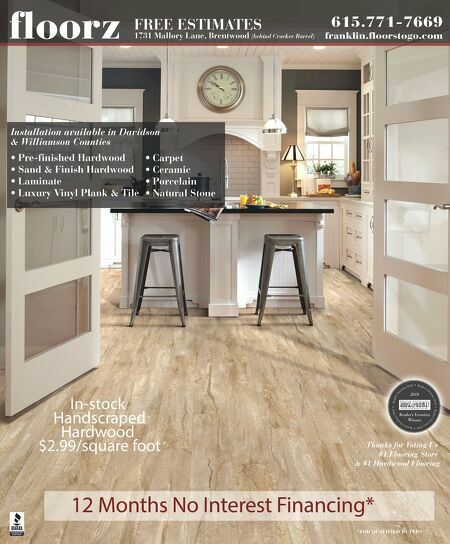 "Homeowners choose hard- wood for a reason—they love wood's authentic, classic vi- sual. Lighter colors do a won- derful job of showcasing the natural character and beauty of hardwood." Noting that white oak is one of the most popular species of hardwood, Hodgkins says that Shaw Floors' Reflections white oak features grey tones and slight distressing that compli- ment the wood's natural varia- tions and graining. Denny reports that the trend in hardwood colors seems to be natural tones, light taupe grays, and muted tones. "That said, we believe traditional colorings using warm tones are making a strong comeback as homeown- ers want a more timeless feel, a more Southern traditional feel," he says. "We're seeing more empha- sis on milling techniques, such as using live sawn oaks versus traditional plain sawn materi- als," says Denny, "thus allowing more of the wood's natural character and beauty to be emphasized." Exotics have taken a sizable hit, as has bamboo. Brazilian cherry, the rage of 10 and 15 years past, is seen less and now replaced by the trendier character grade hardwoods and a return to less pro- nounced natural colors with- out the heavy character. Factory prefinished wood hardwood flooring hardwood flooring Above, photo courtesy Shaw Floors.